The Vance Center’s Women in the Profession program has taken root in 19 Latin American countries whose national chapters continue to innovate programs and share experiences with each other. Here is an update on recent activities. Under the leadership of Cristina Lewis of the Gala law firm and Erika Villarreal of Anzola Robles, the Panama chapter recently obtained non-profit status as Fundacíon WIP Panama and registered thirty new members in the last quarter. The chapter is also working with the National University of Panama’s legal clinic on restructuring its pro bono representation program. Liderando Paraguay, led by Marysol Estigarribia of Ferrere Abogados and Tamara Serrati of Cargill Agropecuraria, has concluded a three-part series of pro bono workshops, entitled “Know Your Rights.” This series connected women attorneys from local law firms with low-income women entrepreneurs to discuss topics such as legal and commercial rights and responsibilities. Abogadas MX, led by its founder Valeria Chapa and Bertha Ordaz of Jones Day, is planning its 400 expected to attend. Past conferences have focused on mentoring, business development, and social resilience. The Brazil Porte Alegre chapter has registered more than 80 participants for the fourth cycle of its women’s mentoring program under the leadership of Raquel Stein of Souta Correa and Ana Amelia Abreu of Thyssen Krup Elevator AG. Their goal is to expand the program to serve women attorneys in both Rio de Janeiro and Sao Paolo. 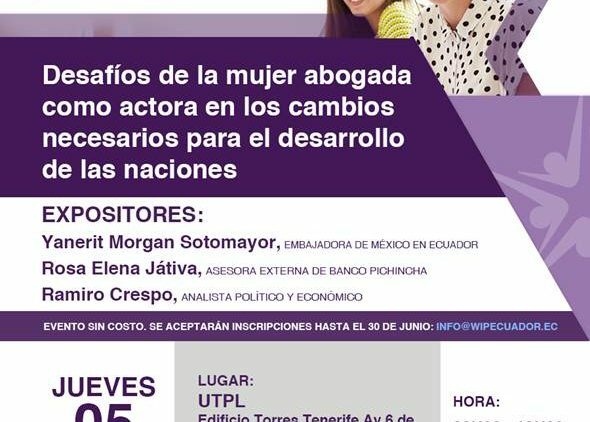 Margarita Zambrano of the law firm Methaler & Zambrano and Paola Gachet of Ferrere Abogados, leaders of WIP Ecuador, have organized a panel in Quito on women attorneys acting as agents of change in international affairs. The featured panelists are: Yanerit Morgan Sotomayor, the Mexican Ambassador to Ecuador; Rosa Elena Jatíva, the head of external relations at Banco Pinchincha; and political and economist analyst Ramiro Crespo. You can now follow the Vance Center’s WIP program at the WIP Vance Center Facebook page and join the LinkedIn group to learn more about upcoming WIP events throughout the Americas.